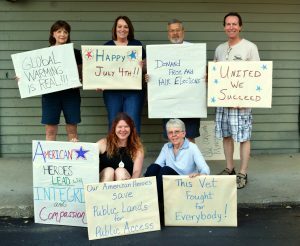 Dedicated volunteers gathered at Kootenai County Democrats Headquarters on Sunday, July 2nd to create signage for the annual 4th of July parade on Sherman Avenue. 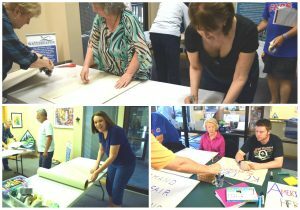 Sign-makers were encouraged to emit powerful and positive messages to proudly display our values to the community. 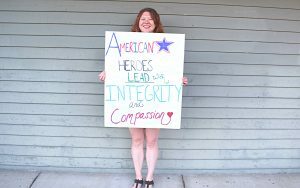 Paula Neils, Kootenai County Democratic Party President, said she hoped we will be “a show of force; a big blue wave” at the parade. In line with Democrats’ respect for environment and sustainability, old campaign signs were repurposed at the event. Volunteers happily collaborated at table stations, sharing markers and messaging ideas. 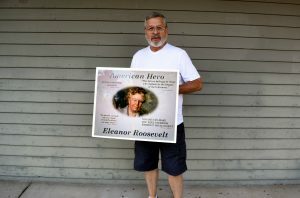 Ruben Miranda, who contributed professional banners for the parade, created signs highlighting Eleanor Roosevelt and Susan B. Anthony for the “American Heroes” theme. 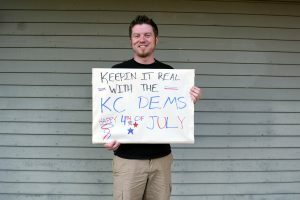 Nash Mahuron, who felt compelled to join the Kootenai County Democrats shortly after the 2016 election, said he hoped we would “show that regardless of party, we are here to celebrate our nation’s independence and not be polarizing. When it comes down to it, we are all Americans.” Nash currently serves on the Candidate Recruitment Committee and is on the lookout for strong potential leaders for our community. 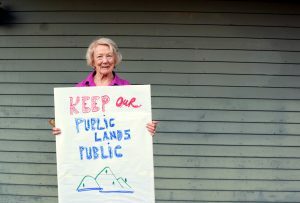 Marcus and Lisa Manning joined the effort to message “the importance of unity and community.” Lisa Manning, a strong supporter of the Democrats, is also a program coordinator for the Kootenai Environmental Alliance where she serves as the Coeur d’ Alene Waterkeeper. Steve and Peggy Cedros, long-term volunteers who are strongly involved in the Democratic Club, were also in attendance. An enormous amount of energy, inspiration and teamwork has gone into the effort for the 4th of July Parade. Blue T-Shirts that display our bold, new logo were sold for $10 at the Sign Making Party for people to wear at the parade in unison. This special introductory offer will be available at the parade as well. 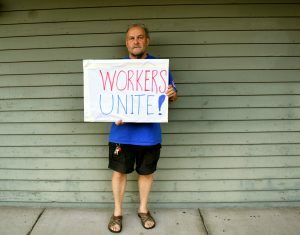 People can also show up wearing their own blue shirt. There will be extra signs to carry during the march as well. Volunteers are to arrive at 9:30 a.m. and meet at North 18th Street between Lakeside and Sherman Avenue. 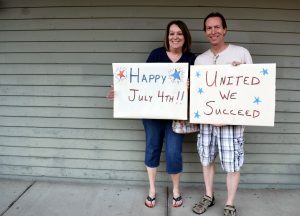 The 4th of July Parade goes from 10:00 a.m. to 11:30 a.m.
Well done, Jessica and Nash! 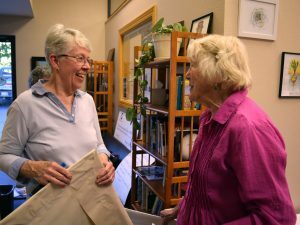 You lend so much skill and energy to our effort to promote Democratic values in Kootenai County.